Press for the National September 11 Memorial Museum, which opened to the public yesterday, has not been entirely positive. Today, in reference to a cocktail party for donors hosted on the final night early access for victims’ families, the Daily News cover reads, “Did you enjoy having drinks on top of my brother’s grave last night?” On Sunday, the Post took on the souvenir store with “Little Shop of Horrors” (“Visit mass grave, buy a T-shirt”). But kicking out reporters for doing journalism probably isn’t the solution. The young woman began to answer, but then a security guard interrupted us, asking, “What are you? You’re a reporter?” I said yes, and he told me, “You can’t ask any questions. 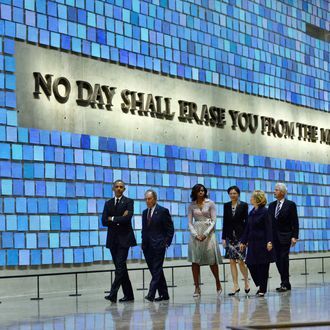 You have to go through the 9/11 Memorial people.” I said okay and left the woman alone. I continued to walk through the exhibit, and a second guard came up to me. “You’re the reporter?” he said. “You can’t ask questions here. You can’t.” I said I understood and reassured him I had only spoken to one person, and she seemed perfectly willing to talk. But in a space paid for in part by taxpayers — and dedicated to American freedoms — the Museum’s handling of this relatively low-stakes situation seems clumsy at best, and bizarrely repressive at worst. “I totally understand that I violated the rules,” said Chung, “but I was sensitive to the fact that it’s a very moving, sad place.” (The woman who was talking on her cell phone, which is also against the rules, was not escorted out.) “I wasn’t being super pushy, I didn’t try to surreptitiously approach people after — they were clearly tracking me,” she said. “I had only asked that one question.” She should’ve saved it for the gift shop.